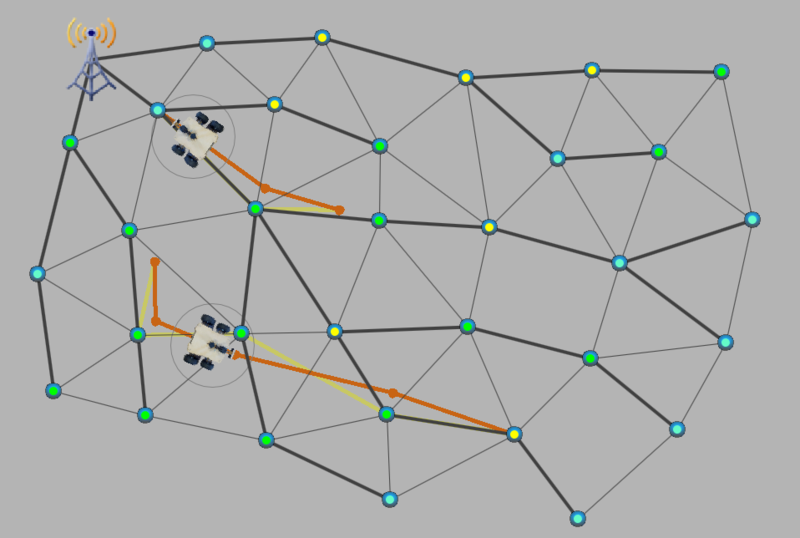 JBotSim is a simulation library for distributed algorithms in dynamic networks. The style of programming is mainly event-driven: your code can react to various events (pulse of a clock, appearance/disappearance of a link, arrival of a message, movement of the node, etc.). Node movements can be controlled by program (e.g. mobile robots or mobility models), or by means of mouse-based interactions during the execution. Beyond its features, the main asset of JBotSim is its simplicity of use. JBotSim 1.0.0 was just released! (CHANGELOG). Note: JBotSim requires Java ≥ 8. → Take the tour ! Have a question about the API? You may ask it on Stack Overflow, with tag jbotsim. If you want to get involved in the project, contact us or join us on GitHub!